The Antonov An-148 (Ukrainian: Антонов Ан-148) is a regional jet designed and built by Antonov of Ukraine. Development of the aircraft was started in the 1990s, and its maiden flight took place on 17 December 2004. The aircraft completed its certification programme on 26 February 2007. The An-148 has a maximum range of 2,100–4,400 km (1,100–2,400 nmi; 1,300–2,700 mi) and is able to carry 68–85 passengers, depending on the configuration. The Antonov An-158 is a stretched fuselage version of the aircraft, accommodating up to 100 passengers. Following a crash in February 2018, which is still under investigation, all An-148 and An-158 in Russia were grounded by the Russian Ministry of Transport. In addition, Cubana grounded its An-158 fleet as of May 2018 due to several technical issues with the aircraft. Until late 2018, the Antonov An-148 aircraft was also being produced in Russia by Voronezh Aircraft Production Association, however due to the souring political relationship between Ukraine and Russia, production in Russia was discontinued. The last Russian-built An-148 was completed in October 2018. The An-148 aircraft is a high-wing monoplane with two turbofan jet engines mounted in pods under the wing. This arrangement protects the engines and wing structure against foreign object damage. A built-in autodiagnosis system, auxiliary power unit, and the wing configuration allow the An-148 to be used at poorly equipped airfields. Flight and navigation equipment features five 15 by 20 cm (5.9 by 7.9 in) liquid crystal display panels built by Russia's Aviapribor and a fly-by-wire system, which enables the An-148 aircraft to operate day and night, under instrument flight rules and visual flight rules weather conditions on high-density air routes. Similar to the Boeing 737, the main landing gear rotates into the belly of the aircraft when in flight, with partial doors covering the legs, and the sides of the tires remaining exposed. Built-in entrance stairs enable boarding and disembarking the aircraft without extra ground equipment. The manufacturer claims high fuel efficiency of the Motor Sich D-436-148 engines. 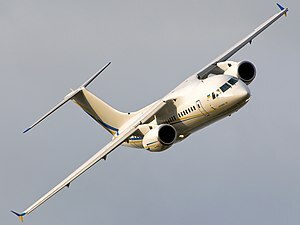 The beginning of the An-148 project dates to the early 1990s, when work on the Antonov An-74 passenger modification started, headed by Petro Balabuev. In 2001, the project was renamed An-148. The An-74 fuselage was extended and the new aircraft's wing design was created from scratch. The developers initially used Motor Sich D-436-148 engines. Other variants with Western-made engines with thrust of 58.86–78.48 kN (6,002–8,003 kgf; 13,230–17,640 lbf) (such as the General Electric CF34 or Rolls-Royce BR700) are being considered. In 2002, production of the first three prototypes was begun at AVIANT. On 17 December 2004, the first prototype completed its maiden flight. The second prototype joined the testing programme in April 2005. During the certification programme, the two prototypes performed about 600 flights in total. On 26 February 2007, the aircraft, its D-436-148 engine and the AI-450-МS auxiliary power unit were certified by the Interstate Aviation Committee of Russia and the State Aviation Administration of Ukraine. The An-148 is manufactured by the Ukrainian Kiev AVIANT plant (now Antonov Serial Production Plant) and Russia's Voronezh Aircraft Production Association (VASO). On 28 June 2009, the first serially produced An-148, manufactured at VASO in Voronezh, took to the skies. Although numerous companies are involved in the project, at least 70% of the aircraft's hardware is made by Russian manufacturers. The An-148's list price is about $24–30 million. The main problem with the project has been increasing the aircraft's sluggish production rate. The then-independent AVIANT plant initially failed to satisfy to growing orders, leading to VASO's growing involvement in the aircraft's assembly. However, as a result of political instability in the Ukraine, VASO announced in June 2017 that the two final Russian-assembled An-148s would be delivered, and the project would not see further development. The An-148-100 regional aircraft is the main model of the An-148. It seats 70 passengers at 864 mm (34.0 in) or up to 80 passengers at 762 mm (30.0 in) pitch in a one-class 2+3 seating layout. The aircraft is also configurable in a multiple-class layout which can carry fewer passengers, typically with four abreast business class. For Siberian operators, Antonov plans a model with a higher gross weight and additional fuel capacity in the center tank, extending the range with 75 passengers from 2,198 km (1,187 nmi; 1,366 mi) to 3,598 km (1,943 nmi; 2,236 mi). An “E” variant is also planned to offer a special 5,100 km (2,800 nmi; 3,200 mi) range, which would serve as a platform for the "E1", capable of non-stop Moscow-Vladivostok 6,995 km (3,777 nmi; 4,346 mi) services carrying 44 passengers. unified with An-158 by the rear part of the fuselage. Hence maximum seating capacity is increased to 89 passengers in dense configuration, comparing to 85 for An-148-100. Planned for production in Kiev with An-158. proposed airborne early warning and control variant. stretched fuselage version for 99 passengers in a one-class standard configuration. Other changes include the installation of wingtip fences. The airplane successfully completed its first flight on 28 April 2010, with flight certification tests planned to be completed before the end of 2010; on 3 March 2011, it was given Russian certification. Nowadays, after flight and land test in night lands airports of Ecuador (Latacunga / Cotopaxi International Airport, 2806 m AMSL) and Bolivia (La Paz / El Alto International Airport, 4061 m AMSL) in November 2013 prepare documentation for obtaining correspondent supplements to the type certificate of this airplane. cargo variant, with a payload capacity of 15 t (15,000 kg; 33,000 lb). The wing outer panels (including winglets), front fuselage with cockpit and nosewheel leg come from the An-158. The cargo hold is slightly enlarged, and there is an extra pair of main-wheels on each side. Designation of An-148 aircraft proposed for licence production from knocked down kits in Iran. In April 2005, the Ilyushin Finance Leasing Company ordered the first series of An-148 for the Krasair airline. Lease agreement calls for ten aircraft with an option for five units valued at $270 million. On 2 June 2009, the first An-148 entered commercial service with the Ukrainian carrier Aerosvit. The first passenger flight was from Kharkiv to Kiev; the aircraft had the civilian registration UR-NTA. By November 2009, Aerosvit was operating the An-148 on the Kiev–Odessa and Simferopol–Lviv routes, performing two flights a day with the average flight time of 4–5 hours. On 21 December 2009, the An-148 was put into service in Russia with Rossiya airline. The first passenger flight was FV135 from Pulkovo Airport in Sankt Petersburg to Sheremetyevo International Airport in Moscow. By 20 May 2010, Rossiya's An-148 fleet had accumulated a total of 915 flight hours and performed 710 landings. Rossiya complained that the aircraft experienced some reliability problems. There were some technical problems with the aircraft, and pilot training could not be ramped up fast enough, leading to pilot shortages. However, by 2011 the situation had clearly improved. On 15 February 2010, the An-148 started international flights to the European Union (Poland) with the Aerosvit airline. On 18 April 2013, the first serial An-158 version was delivered to the Cuban flagship airline Cubana de Aviación. According to Antonov, Cubana additionally ordered two more aircraft, while other sources report this order to be for ten aircraft. On 28 April 2013, Ukraine's Antonov aircraft maker handed over a third An-158 passenger airliner to Cuba and signed a contract for the delivery of three more. The Russian ambassador in Bolivia and the government of Evo Morales are negotiating the acquisition of one aircraft of this type for use as the presidential carrier and another eight for the state-owned airlines: Boliviana de Aviación (BoA) and Transporte Aéreo Militar (TAM). In April 2016, Indian company Reliance defense limited and Antonov entered into an agreement to construct an aircraft based on An 148/ An 158 for defense and commercial purposes. In April 2017, Cubana de Aviación suspended its flights between Havana and Guantánamo due to "technical problems" with its An-158 fleet. The route from Havana to Holguín also had problems: of 116 planned flights in the first months of 2017, 38 were cancelled and 36 suffered significant delays. Yoanka Acosta, head of Cubana's commercial division, explained that the planes were leased from Ukraine but spare parts were sourced from Russia, so the state of conflict between the two countries had affected the supply of parts, making maintenance difficult. In late April, however, representatives from Antonov and Cubana met and signed a service agreement that extended the aircraft's navigation directives to 3,600 flights and guaranteed the supply of spare parts, although it did not specify a date for normalization. In March 2018 Rostransnadzor suspended all flights of An-148 in Russia after crash on 11 February 2018. Sources: Antonov Design Bureau, United Aircraft Corporation, flightglobal.com, Aviant. On 5 March 2011, an Antonov An-148 (assembled by VASO) carrying test registration 61708 crashed during a test flight in Russia's Belgorod Oblast after an inflight breakup, killing all six crew members on board. An investigation commission found that the crew permitted the aircraft to accelerate more than 60 knots above its "Never Exceed" speed in an emergency descent, which led to the inflight breakup. Witnesses on the ground reported a wing had separated from the aircraft in flight. The aircraft was due to be delivered to Myanmar, where two of the dead were from. On 11 February 2018, an Antonov An-148 operating as Saratov Airlines Flight 703, crashed shortly after take off near Ramenskoye, outside of Moscow. The aircraft was carrying 65 passengers and 6 crew members. There were no survivors. This is the first fatal commercial accident for this aircraft type. ^ "Ukrainian Antonov Design Bureau original AN-148 Specification". Archived from the original on 25 January 2018. ^ a b "Russia's UAC to invest $160 mln in An-148 manufacturer". RIA Novosti. 28 July 2009. Retrieved 28 July 2009. ^ "Rеестр самолётов типа Антонов Ан-148". russianplanes.net. Retrieved 31 December 2016. ^ "bmpd". livejournal.com. Archived from the original on 11 January 2016. Retrieved 3 July 2015. ^ "Корпорация "Иркут"- Техническое описание Ан-148-AEX.RU". ^ "An-148 production to be reduced by 1/3 for 2010". ^ Сороковая, Екатерина; Пядушкин, Максим (21 July 2010). "ИФК заказала 20 самолетов Ан-158" [IFC has Ordered 20 An-158 Aircraft]. Air Transport Observer (in Russian). A.B.E Media. Retrieved 11 January 2014. ^ Зверева, Полина (29 August 2013). "Cubana de Aviacion получает третий Ан-158" [Cubana de Aviacion gets a third An-158]. Air Transport Observer (in Russian). A.B.E Media. Retrieved 11 January 2014. ^ "Ространснадзор предписал приостановить полеты Ан-148 после катастрофы". РБК. Retrieved 2018-03-20. ^ "Russia Grounds All AN-148 Planes Over Safety Fears After Plane Crash". Retrieved 2018-03-20. ^ a b Diaz, Pablo (May 17, 2018). "Cubana de Aviación Grounds Antonov 158 Fleet". Airline Geeks. Retrieved 2018-05-18. ^ "Flight International, World Airliner directory - special report". Retrieved 2018-11-14. ^ "Появились фото испытаний последнего АН-148, собранного в Воронеже для Минобороны". 36on.ru (in Russian). Retrieved 2019-01-19. ^ "Russia curtails production of the Antonov An-148 regional jet". Russian Aviation Insider. Retrieved 2019-01-19. ^ a b c d e Синицкий, Алексей (1 November 2009). "Antonov-148 jet enters in service in Russia". Air Transport Observer. A.B.E Media. Retrieved 12 February 2011. ^ "An-148". Antonov.com. Antonov ASTC. 2004. Archived from the original on 25 January 2018. Retrieved 27 June 2006. ^ a b c "History of An-148". United Aircraft Corporation. 2010. Archived from the original on 3 October 2011. ^ "AN-148". Antonov Design Bureau. 2010. Archived from the original on 25 January 2018. ^ "Russia to produce Ukrainian-designed passenger jet". RIA Novosti. 19 July 2010. 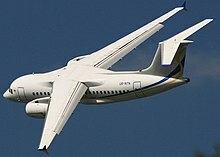 ^ "Russia will finish the production of the An-148 after completing the assembly of two aircraft - News - Russian Aviation - RUAVIATION.COM". www.ruaviation.com. ^ "Aircraft fleet". polet.ru. Archived from the original on June 16, 2013. Retrieved 27 May 2013. ^ ""Антонов" готовит новую модификацию Ан-148". АвиаПорт.Ru. Retrieved 26 December 2014. ^ "New customer of ANTONOV-148". Deagel. 16 June 2009. Retrieved 8 August 2012. ^ "Antonov to produce new airborne early warning and control aircraft for Ukrainian Air Force". Defence Blog. 8 May 2017. Archived from the original on 8 May 2017. Retrieved 8 May 2017. ^ a b c Francis, Leithen (28 September 2009). "Antonov discloses An-158 specifications". Flightglobal. Beijing: Flight International. Retrieved 17 March 2010. ^ Zaitsev, Tom (16 March 2010). "Antonov points to 9 May for An-158 first flight". Flightglobal. Moscow. Retrieved 17 March 2010. ^ Karnozov, Vladimir (2009). "An-148 First Revenue Flight". Air Fleet. No. 3. A4 Press. Archived from the original on 15 July 2009. Retrieved 17 March 2010. ^ "Maiden Flight of AN-158 Has Been Fulfilled without Problems". Retrieved 26 December 2014. ^ Kaminski-Morrow, David (3 March 2011). "Russian authorities certificate An-158". Flightglobal. Flight International. Retrieved 3 March 2011. ^ "Antonov Design Bureau begins to design An-178 transport aircraft". Radio Ukraine International. 24 February 2010. Archived from the original on 20 February 2011. Retrieved 17 March 2010. ^ "На базе пассажирских Ан-158 намерены создавать грузовые самолеты". Retrieved 26 December 2014. ^ "Latest Antonov Cargo Jet On Show". Aviation Week. 15 June 2015. Retrieved 15 June 2015. ^ Ryzhkin, Sergey (7 June 2005). "Aircraft for the Provinces". Kommersant. Archived from the original on 8 July 2006. Retrieved 26 June 2006. ^ "Antonov Design Bureau developing new aircraft on base of An-148, industrial ministry says". Interfax-Ukraine. 9 June 2009. Archived from the original on 7 June 2013. ^ Karnozov, Vladimir (1 November 2010). "Supporting An-148". Russian Aviation. Retrieved 12 February 2011. ^ a b Karnozov, Vladimir (1 November 2010). "An-148 proves worthy of airline service". Russian Aviation. Retrieved 12 February 2011. ^ "Rossiya slams An-148 reliability". Flightglobal. Flight International. 1 October 2010. Retrieved 2 October 2010. ^ "An-148 monthly utilization rose to 270 flight hours". Russian Aviation. 19 January 2011. Retrieved 19 January 2011. ^ "A wing to EU". Kyiv Weekly. 1 April 2010. Archived from the original on 14 March 2012. ^ "An-158 gearing up for new orders". Take-off Magazine. Archived from the original on 17 February 2013. Retrieved 27 May 2013. ^ a b "'Problemas técnicos' de los An-158 provocan retrasos y suspensiones en vuelos nacionales" ['Technical problems' with the Antonov An-158 cause domestic flight delays and suspensions]. Diario de Cuba (in Spanish). Havana. 2017-04-21. Retrieved 2017-05-16. ^ "Empresa ucraniana Antonov y Cubana de Aviación firman acuerdo" [Ukrainian company Antonov and Cubana de Aviación sign an agreement]. CiberCuba (in Spanish). Havana. 2017-04-28. Retrieved 2017-05-16. ^ "An-148 Flight Performance" (in Russian). United Aircraft Corporation. Archived from the original on 28 April 2010. Retrieved 15 August 2009. ^ "Air Koryo to rejuvenate fleet with Antonov An-148". ch-aviation.ch. 21 November 2012. Retrieved 25 May 2013. ^ Mikhail Fomichev (28 March 2012). "Russian Regional Airline to Buy 3 An-148s". RIA Novosti. Retrieved 12 August 2012. ^ "Новый самолет АН-148 авиакомпании "Ангара" совершил посадку в Иркутске". Новости. Angara Airlines. Archived from the original on 30 November 2012. Retrieved 31 October 2012. ^ "The Russian Ministry of Defence buys 15 passenger airplanes Antonov AN-148". Air Recognition. 11 June 2013. Retrieved 17 June 2013. ^ "Russian Aerospace Forces to Receive Three An-148 Passenger Aircraft in 2017". Sputnik. 14 March 2017. Retrieved 16 September 2017. ^ "Последний российский Ан-148". bmpd.livejournal.com. 18 October 2018. Retrieved 21 October 2018. ^ Karnozov, Vladimir (24 November 2010). "Emercom orders two An-148s". Russian Aviation. Retrieved 16 January 2011. ^ "Второй самолет Ан-148 для государственной авиакомпании "Украина"". ^ "UAC will deliver three An-148 aircraft to the Federal Security Service". Russian Aviation. 7 May 2014. Retrieved 25 May 2014. ^ Gusarov, Roman (15 May 2013). "Welcoming An-158 in Cuba". Russian Aviation. Retrieved 27 May 2015. ^ Hradecky, Simon (5 March 2011). "Crash: Antonov A148 near Voronezh on Mar 5th 2011, in flight break up". The Aviation Herald. Retrieved 5 March 2011. ^ "Six dead as An-148 plane crashes in southern Russia". Moscow: Sputnik. RIA Novosti. 5 March 2011. Retrieved 5 March 2011. ^ "Plane with 71 on board goes missing after taking off from Moscow". Russia Today. Retrieved 11 February 2018. Wikimedia Commons has media related to Antonov An-148. This page was last edited on 28 February 2019, at 02:29 (UTC).